In this groundbreaking work, social anthropologist David Sneath aggressively dispels the myths surrounding the history of steppe societies and proposes a new understanding of the nature and formation of the state. Since the colonial era, representations of Inner Asia have been dominated by images of fierce nomads organized into clans and tribes-but as Sneath reveals, these representations have no sound basis in historical fact. Rather, they are the product of nineteenth-century evolutionist social theory, which saw kinship as the organizing principle in a nonstate society. Sneath argues that aristocratic power and statelike processes of administration were the true organizers of life on the steppe. 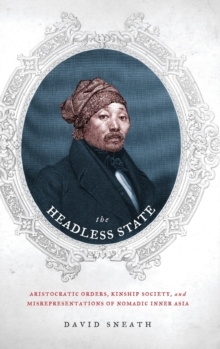 Rethinking the traditional dichotomy between state and nonstate societies, Sneath conceives of a "headless state" in which a configuration of statelike power was formed by the horizontal relations among power holders and was reproduced with or without an overarching ruler or central "head." In other words, almost all of the operations of state power existed at the local level, virtually independent of central bureaucratic authority. Sneath's research gives rise to an alternative picture of steppe life in which aristocrats determined the size, scale, and degree of centralization of political power. His history of the region shows no clear distinction between a highly centralized, stratified "state" society and an egalitarian, kin-based "tribal" society. Drawing on his extensive anthropological fieldwork in the region, Sneath persuasively challenges the legitimacy of the tribal model, which continues to distort scholarship on the history of Inner Asia.